We had an amazing turnout for our Location Engine and Gateway Webinar and we thought it would be a great idea to combine some of the questions and feedback we got in one place. Here are some answers and more detailed explanations to many of the topics that were mentioned most often. Start here: What is Gateway? What is Location Engine? Location Engine is a tool that enables you to access the data that the Gateway transmits. In Location Engine, you can check where your beacons are, how much time they spend within the range of each Gateway, when they entered or exited each Gateway’s range, and so on. How do I set up a Location Engine infrastructure? Do I need to add my Gateways first? 1. Create a venue (if you haven’t created one yet). 2. Assign at least one Gateway to the venue. 3. Go to Location -> Places, and open the venue you’ve just assigned your Gateway(s) to. 4. Upload your floor plan. 5. Scale the floor plan by marking a given space and assigning a real-world distance it represents. 6. Place the Gateway(s) on the floor plan. 7. Go to Presence and click “Play”. Why do we need to set the distance while setting up the map? How accurate is the tool? After you’ve uploaded your floor plan to Location Engine, you’ll be asked to draw a line on it and assign a value (in centimeters) it represents in the real world. This is done to properly scale your floor plan so that Location Engine can provide you with correct data. If you know the dimensions of your room, the easiest way to do this will be to draw a line between the walls and type in the real-world distance between them. If you don’t know the measurements, though, pick an area that is easy to measure, for example door width (which is typically 32-36 inches/ 80-90 centimeters). The tool measures the amount of pixels from one designated point to another point on the floor plan, and the minimum real-world distance that can be assigned is greater or equal to 0.1 cm. How do I know where to put the Gateway on the map? The location of Gateways on the map should mirror their location in the real world. That’s why we recommend you place your “virtual” Gateway on the floor plan after you’ve deployed a real Gateway at a venue. Does having a Gateway mean I don’t need to develop an app? It depends on what you want to achieve. If you want to trigger push notifications to your customers’ smartphones, you definitely need an app. If you want to interact with your visitors but push notifications aren’t a must, you can go for no-app solutions with Location Engine. For example, you could equip your customers with Card Beacons (acting as loyalty cards) and email them when they enter your venue (if you have their email addresses, of course). Also, if you use your app for tracking—for example to report on footfall at your venue—then Gateway and Location Engine will do the job, and no app is needed. Can Gateway only recognize Kontakt.io beacons or does it “see” others too? Currently, the Kontakt.io Gateway recognizes other BLE devices, however, they will not be represented in the Panel. 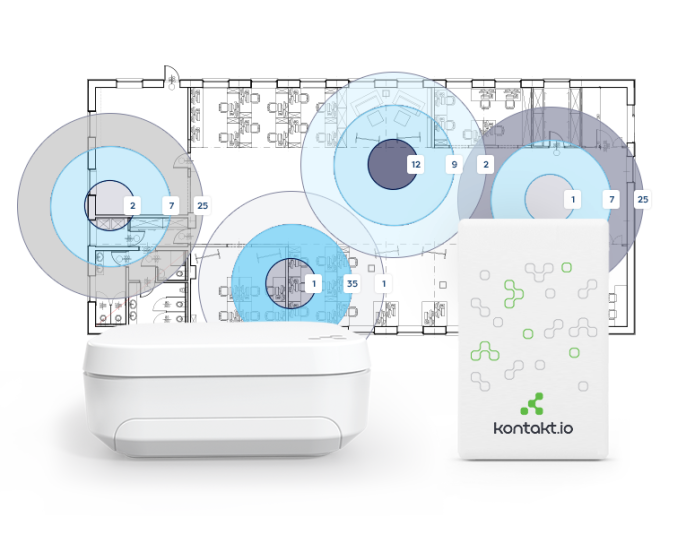 If you’d like to gather data from the other devices than Kontakt.io beacons, you can collect them with a simple API call and receive the MAC addresses of different beacons and BLE devices. Can Gateways transmit data to the cloud over cellular (3g/4g) rather than connecting to a client’s network? The Gateways are equipped with a WiFi module and can connect to any WiFi access point, including 3G or 4G modems. How many beacons can Gateway detect? There is no limit to the number of beacons a Gateway can scan. While scanning a very large number of Bluetooth devices at once, e.g. 250 beacons, the readings from the Gateway might be skewed due to the signals overlapping. How frequently does Gateway transmit data to the cloud? Gateway sends the data to the cloud approximately every 1.5 seconds. Does the Gateway work with iBeacon and Eddystone beacons at the same time? What is the near/far range of the Gateway in meters? Can this be changed? The ranges of the Gateway resemble the ranges specified in the iBeacon profile. The near range represents approximately 2-5 meters, the far range: 5 meters and above. They cannot be changed. Do I always have to use a smartphone or tablet as a Gateway? We created Software Gateway to enable you to test how Gateway works and start developing your own location tracking solutions even before you get the hardware version of the Gateway. Unless you’re fine with deploying smartphones around a venue and keeping them charged, treat the Software Gateway as a showcase of what the Hardware Gateway can do. Can Gateways be used to send campaigns to all beacons connected to them? No. Gateway collects beacon data and then sends it to the cloud. This is the only way the communication works. How does real-time data transmission to the cloud impact the battery life of Gateway and beacons connected to it? Gateway is USB-powered so it works as long as it’s plugged into a power source. When it comes to other beacons, the Gateway is passive: it doesn’t send or trigger anything so your beacons aren’t affected by it in any way. How many beacons can I add to my Location Engine? There’s no limit to how many Kontakt.io beacons you can add. An item defines the carrier of your beacon to let you quickly filter your beacons. Say you use beacons to track assets and monitor employees. Items help you distinguish the two groups so you can get insights on the data you’re interested in at a given time. Currently, there are three item categories: Person, Package, and Other. Will the Location Engine determine the approximate distance of any BLE beacon or Kontakt.io beacons only? The Panel-based Location Engine works with Kontakt.io beacons only. If you want to receive data on other beacons, use our API. Can I triangulate or trilaterate the specific location of a beacon using multiple Gateways? How many Gateways would I need? This feature isn’t currently available. How do I track the real-time location of beacons through the Kontakt.io API? Through the API, you’ll be able to gather all data that is visible in the Panel and more, and use it and process it in any way you desire. The API documentation will be available soon. Can I track assets on multiple floors? How does Location Engine work in multi-floor environments? The multiple floors feature is in development and will be available in the future. In case different Gateways in different rooms receive identical signal strength from a single beacon, how will Location Engine decide where the beacon is located on the map? In this scenario, the beacon will be picked up by both Gateways. In the Panel, you’ll see it on two lists. Can I assign custom names to beacons so that I can see e.g. people’s names (instead of beacon IDs) on the floor plan? Yes, you can create custom names for beacons in the Items section. After you do so, you’ll see the custom names right next to the beacons’ IDs. In the Analytics section, do I see a list of all my beacons or the ones in range? Currently, you can see all beacons that are in the range of a particular Gateway. Are there any requirements or limitations when it comes to my venue? How big or small can it be? There are no such limitations. Keep in mind, though, that the bigger your venue, the more Gateways you’ll need to cover the entire space. How can I use Gateway and Location Engine to track assets or workers in a factory? – Fill out a virtual attendance list when your employees enter and exit the workplace. – Text them a message and say hello when they show up. – Get insights on how they spend their time to improve work efficiency. What are some potential use cases of Location Engine in retail? Or attach beacons to your carts and analyze how your visitors navigate the store! Any ideas about how Location Engine could work in the event industry? When will the Hardware Gateway and Software Gateway be available? Software Gateway is already available in the latest version of our Admin App for Android. The iOS version is soon to be released. When it comes to the Hardware Gateway, they will start shipping in early November. Will there be APIs available for integration purposes (besides the trigger stuff, but more about checking the current/last known ‘presence’ of a beacon)? We’re releasing the API documentation soon, so you’ll quickly be able to integrate Location Engine with your own platform. Will be there a new API version for the new features and when? There’s already a new API version that supports Location Engine. The documentation is coming soon. How much does Gateway cost? The Kontakt.io Gateway costs $89 plus shipping. Do you plan to add a multi-floor option? When do you plan to add trilateration to Location Engine? Currently, there are no plans of adding trilateration. If I switch off the card beacon and only use it once a week per year, would it last longer than 18 months? The 18-month battery life refers to Card Beacons being used 8 hours a day at 550 ms interval, and with power saving turned on. So in your scenario, it’s very likely that your beacons will last longer than that. Can I use triggers when the moving asset is a smartphone rather than a beacon? We hope this answers any questions you may have had about Location Engine. If you can’t find what you’re looking for here or in the documentation, use the comments below to tell us what’s on your mind and we’ll get back to you as soon as possible. Also, if you weren’t able to take part in the webinar or you would like to watch it again, you can find it here. How much will be cost the use of location Engine? Hi. Is this $30 for the first three months or is it $30 for three months. Can you pay monthly / annually? Is the price per site / venue and does it increase as the scale of the operation and deployments increase? I am trying to understand what the ongoing costs are if I start to use the Location Engine. Do you have any pricing pages / information that I can read?